The idea for this dish started with a Greek whipped feta recipe we discovered. The feta is creamed with olive oil and lemon juice, and typically used as a dip or appetizer. Here we use whipped feta as the "sauce" for a pasta with spiced chickpeas. The flavors are distinctly Mediterranean, but unusual at the same time. Combine chickpeas, tomatoes, garlic, mint, olive oil, and salt and pepper to taste. Let sit at least one hour at room temperature. Make Whipped Feta by combining all the ingredients in food processor until smooth and creamy. Set aside. Cook pasta. Drain and toss with a small amount of olive oil. Top with spiced chickpeas, then a big dollop of whipped feta. Eat while pasta is still hot. 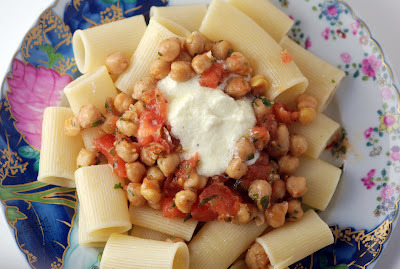 Pasta with Spiced Chickpeas and Whipped Feta made the Foodbuzz Top 9 today! The Foodbuzz Top 9 is a photo-driven collection of top-buzzed posts within the Foodbuzz community. Congratulations again, and thanks for being a part of Foodbuzz! This looks so delicious! Nice picture too! I saw this today and thought how perfectly the whipped feta would go with a green veggie soup, like this Brussels sprouts soup. Delicious idea. Frothy feta cheese just sounds so wonderful. The whippped feta sounds lovely. Happy New Year! I am a big fan of Feta (especially made with sheep milk). I've never tried it whipped before. This looks delicious. Best Wishes for the New Year! This looks wonderful -- and I love the idea of whipped feta. Yum. I'm still catching up with my inbox, but I am so glad I saw this. LOVE the whipped feta! Now this is wonderful! I've never made pasta with chickpeas OR whipped Feta! Definitely a must-try for me next time! Like Trix, I'm also catching up on my inbox. Happy new Year! This looks like a real winner! Gotta try it soon. Thanks. Whipped feta? Cool! Sounds tasty.